Some pasture blends offered by seed marketers come at a more attractive price point than others. Instead of matching the blend to fit an area, some companies use a least-cost formulation. Reynold Bergen, Canada’s Beef Cattle Research Council (BCRC) science director, writes that blends should contain grasses and legumes that grow well together and are well adapted to the environment and soil type where they will be established. 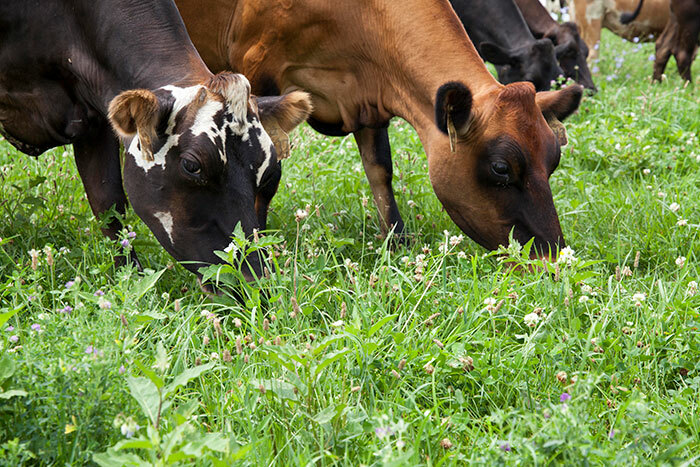 The pasture blend also must tolerate grazing and produce good animal performance. In the Canadian Cattlemen, Bergen notes that some companies do not formulate ideal blends because of limited resources that fail to provide critical information. Forage breeding plots are often too small to graze, and yield is frequently determined by mechanical harvest. Bergen explains that forage improvement programs that integrate the breeding, agronomics, and grazing management research programs to gather the needed data take a long time and are very costly. In response to this, Canada’s Beef Science Cluster has helped with research that examines long-term trends in forage yields, nutritional value, animal performance, and species composition of complex grass-legume blends. In the spring of 2010, four different combinations of timothy, meadow fescue, reed canarygrass, Kentucky bluegrass, tall fescue, meadow bromegrass, and orchardgrass were seeded with either birdsfoot trefoil or alfalfa in Nappan, Nova Scotia. From May through October of the following years, these grass legume-pastures were grazed through 2016 with cattle cycling through each pasture mix from two to seven times per grazing season, depending on rainfall and temperature. Grazing started when pastures were at least 10 inches and were left to recover to the starting height each time cattle were removed. For better estimates on forage yield and quality, small portions were clipped to determine total digestible nutrients, fiber, crude protein, and sugars. Finally, researchers determined the proportion of grasses to legumes at least twice per grazing cycle. Using results from the five completed grazing seasons, the researchers found that the chosen legume trumped any specific grasses in the blends from a forage yield, forage quality, and animal performance standpoint. In terms of forage yields and quality, blends that included alfalfa as the legume came out on top. Average yields were 10 to 20 percent higher for seed blends based off of alfalfa, as opposed to birdsfoot trefoil. The same was true from a quality standpoint with crude protein averaging 18 to 25 percent higher and 3 to 4 percent more total digestible nutrients. However, the ratio of sugars to crude protein averaged 50 to 78 percent higher for blends containing birdsfoot trefoil. Conversely, birdsfoot trefoil had the edge in animal performance. Birdsfoot trefoil stands contributed to average daily gains that were 2 to 6 percent higher, resulting in 30 to 44 percent greater total animal gains per acre over the grazing season. The researchers attributed this to birdsfoot trefoil’s higher sugar to protein ratio, which allowed rumen bacteria to digest and synthesize protein more efficiently since readily digestible sugar was present. Because birdsfoot trefoil contains condensed tannins, protein digestion in the rumen may have been reduced. The researchers noted that having that protein digested in the small intestine instead of by the rumen bacteria might have contributed to more efficient animal growth. Although all pasture stands started with 25 to 30 percent legumes, the alfalfa and birdsfoot trefoil had all but disappeared by the fifth year of grazing. As a result, forage yields fell by 20 to 30 percent with continual loss of legumes. Given the relationships between legume content, forage yield, and animal performance, researchers were not surprised when differences between the blends diminished by year five. In the end, the right blend comes down to its use. This study points to using birdsfoot trefoil blends for grazing and alfalfa blends for production of hay to be sold by the ton. While Bergen suggests this for Nappan, its growing season length, soil pH, moisture, and temperature aren’t representative of many other areas. Always take regional differences into account.